Happy Thoughts of Home Everybody. This is such a beautiful time of year and we love seeing what you have to share. 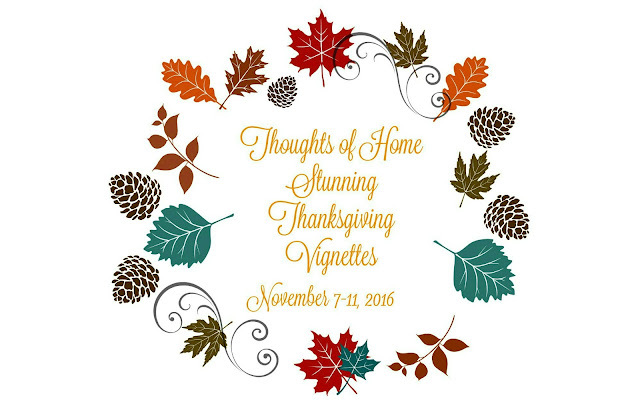 Before we proceed, we want to invite you to visit Thoughts of Home Stunning Thanksgiving Vignettes next week, November 7-11. We'd love for you to link up with us on Thursday. Our hostess this week is Stacey from Poofing the Pillows. She's busy packing boxes and preparing to move shortly. You are invited to follow the adventures on Instagram. Now onto this week's features. Jeanie at The Marmelade Gypsy makes regular visits to the most beautiful place called Southern Exposure. While there she visits the gardens, has wonderful meals, and participates in art classes. It looks just wonderful! Now get ready for this decadence! 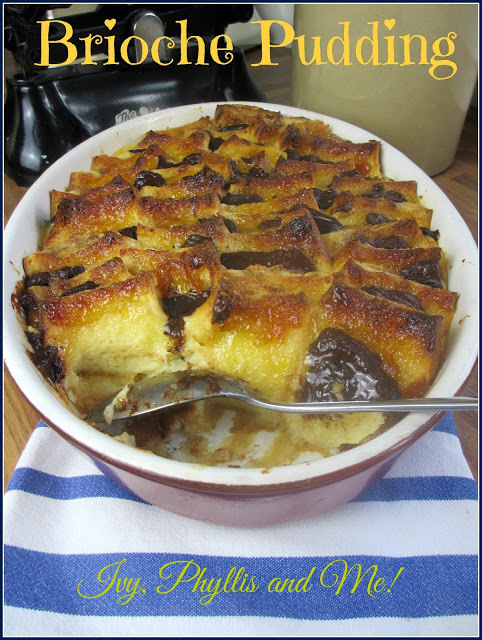 Daphne at Ivy, Phyllis and Me shared Brioche Bread Pudding with butter, marmalade, and dark chocolate. That just sounds incredible! At Mia Bella Passions, Tracey introduced us to the sweetest new plant called Garvinea. Just looking at this flower makes me smile. I look forward to finding this plant and adding it to my gardens. Turning a carport into a garage looks like a piece of cake at Hawthorne and Main. Be sure to check out the amazing job they did all on their own and take a peek at the floor. At While I Linger, Jolena shared shots of her home dressed to welcome Autumn. I love the way she includes items that mean something special to her in the decor. Thank you sweet friends for following along with us week to week. This linky party is really about you and how you make your homes special. We ask that you please: 1. Link back to this post or any of the four hosts websites. Stacey from Poofing The Pillows Laura of Decor To Adore Jemma from At Home With Jemma Laura of White Spray Paint 2. Share up to three of your favorite posts, remembering to not link to advertising or shops. I heartily thank you for hosting me today, last week features are truly lovely and to be a guest of yours is always such a treat ! Thank you for including my autumn dressed living room in your collection this week! What a sweet surprise to be included with such lovely company. Have a great week! Thanks for hosting! Hope the packing is going well. Thanks so much for sharing the lovely features, Stacey, and for hosting. Best of luck in packing and in your new adventure! Thanks so much for including me in the features, Stacey! Lots of wonderful links again today and I can't wait to check them out! 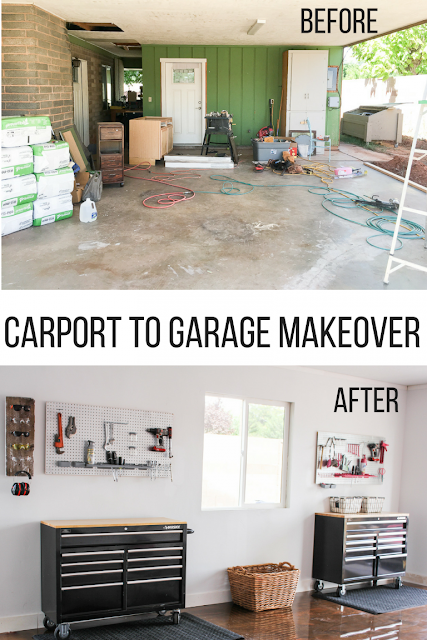 Wow, Stacey, can't believe that carport to garage makeover - outstanding! Thanks so much for hosting TOHOT. You gals are very much appreciated! Thanks for the fun today Stacey! Looking forward to next week! Thank you for the party, Stacy. It's so much fun to be joining you this time around. So glad to join in the link up again this week. It's been busy here. I received my beautiful Glamour Farm cardigan yesterday and finally my Ramsign house number so I thank you very much for thr recommendation and the win from your give away. Hope you have a wonderful weekend! Oh My you have a gorgeous home Stacey! I love each space which is done so uniquely. That hutch is to swoon over.